are still some that can catch you off guard. Vlurma is one of those names. Without looking up the data, I’ll hypothesize that there’s a 100% success rate of people named “Vlurma” making significant cultural contributions. 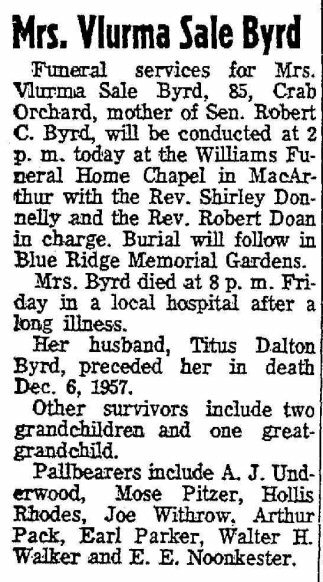 But lots of people have funny names – just in that obituary, there are Mose Pitzer, Walter H. Walker, and E. E. Noonkester – so what makes Vlurma Sale Byrd and Titus Byrd stand out? While living in Crab Orchard, West Virginia, they adopted a young child named Cornelius Calvin Sale, Jr. and out of a household that would make Ras-I Alujah “Livingstone” Bramble from St. Kitts and Nevis blush from funny name inadequacy, came one of the most significant political careers in American history. Young Cornelius was renamed “Robert Byrd” and went on to serve the longest career in the U.S. Senate and U.S. Congress ever. 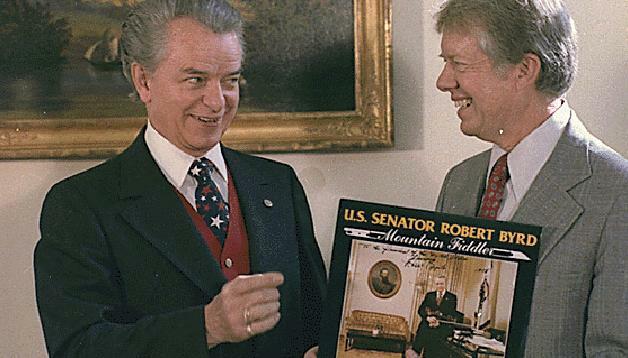 His 57-years in Congress (including 51 in the Senate) saw Democratic Senator Byrd evolve into one of the most beloved politicians of all time. As a young man, he had spent a year as a Grand Wizard in the KKK, a decision he would later regret after he realized that being a Grand Wizard didn’t fly politically outside the friendly confines of West Virginia. He went on to renounce all forms of racism and two years before his death in 2010, he endorsed Barack Obama, who would become the first African American president of this country. Along the way, he served as Senate Majority Leader (twice), Senate Minority Leader, Senate Majority whip, and was regarded as the last great rhetorical senator. An extremely hard worker, he earned a law degree while taking night classes during his tenure as a U.S. Senator. Oh, and he was an accomplished fiddler too. He fiddled John Denver songs for constituents in his Senate office, he fiddled and sang (and hollered!) while wearing a sweet vest on Pop Goes the Country, and presented an album of fiddle music to President Jimmy Carter, a fellow Southern Democrat. He also published nine books, including a landmark four-volume history of the U.S. Senate. In his later years, he would unfortunately become famous to younger audiences for a bizarre, but impassioned, speech about barbarism and valleys in light of the Michael Vick dog fighting scandal. Nonetheless, after his death in June 2010, he was remembered fondly by allies and enemies alike as one of the giants of the United States Senate. But Senator Robert Byrd would have never existed if it weren’t for two selfless West Virginians who adopted a young Cornelius Calvin Sale, Jr. whose parents had both passed away in the 1918 Flu pandemic. That’s what earns them – and not E. E. Noonkester or Mose Pitzer – a spot in the funny names hall of fame. This entry was posted in Greatest hits and tagged funny names, history, humor, politics, women. Bookmark the permalink.